It is not only films that are lost; too often it is film technology too. Many of the cameras, projectors and other equipment of the earliest years of cinema before such machines were manufactured en masse have disappeared. Other early cameras and projectors exist as single models, lovingly cared for by museums and collectors, but inevitably inaccessible to most. We do have the patent records, and they can tell the specialist a lot, but there is nothing quite like having the real machine in front of you for a proper realisation of history. 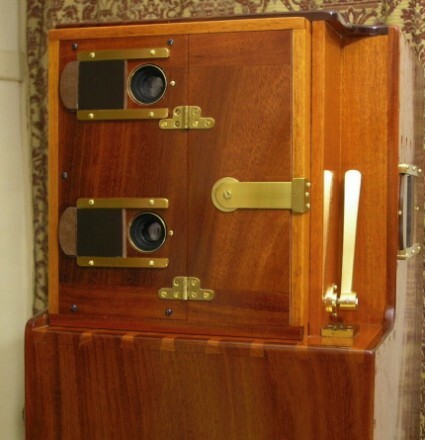 In 2000 the collector Gordon Trewinnard began a project to create working replicas of the first motion picture cameras. With advice from early film tchnology specialist Stephen Herbert and with the engineering skills of some bright and dedicated people, he has funded the production of a number of cameras key to motion picture history. This has not been just an exercise in creating objects a collector might not otherwise be able to obtain. The construction of the cameras (which can of course be used to shoot film) not increases our understanding of early film practice, but can overturn previously held assumptions derived from documentation alone. It soon became clear that the design as shown in the British patent would not have worked – there was a serious error in the gear ratio in relation to the cam and sprocket teeth – and the design shown in a workshop drawing would not have produced the profile that can be seen in the photograph of Acres filming the Derby horse race in the Spring of 1895. Instead the camera ued by Acres to film the Derby (and presumably earlier films) matches a later German patent, Acres having journeyed to Germany just days after filming the Derby. The fine details of who did what, with what, and with what effectiveness, in the earliest months of British film are mostly of concern only to the specialist, such is the complexity of the technical matters at hand. But what is clear is that building the camera that no longer exists has changed film history, and a few bright minds are going to go back to the drawing board and find out what exactly did happen between Acres and Paul in 1895. The Acres camera is illustrated in gleaming detail on the new project website, The Impossible Cameras. Other cameras on display, with authoritative explanatory texts, are Georges Demenÿ‘s Chronophotographe of 1895-96 (based on a surviving example in the collection of the Cinématheque Française); Wordsworth Donisthorpe and William Carr Crofts’ lost Kinesigraph of 1889, which successfully shot a test film of Trafalgar Square in 1890 and owes much of its design ideas to the wool-combing machines developed by the inventors’ fathers; the American Charles Francis Jenkins‘ Phantascope of 1894 continuous-motion film camera with four lenses (the original of which is long lost), which has been sucessfully tested i.e. by shooting film; and Louis Aimé Augustin Le Prince‘s single lens camera of 1888. The Impossible Cameras documents the project so far. The aim is produce recreations of thirteen cameras in all. It will be particularly fascinating to find out what they learn from reconstructing the little-known Léon Guillaume Bouly‘s Cinématographe, patented in 1892 three years before the Lumière brothers appropriated the name for their own invention. Meanwhile what we have here is what is known as experimental or reconstruction archaeology – building lost technologies or artefacts to see if they actually worked – applied to film history. It’s a lesson to us all never to take anything for granted, nor to accept that any sort of history is necessarily lost. It just takes a little application, and imagination. Bravo to Gordon Trewinnard. I have often found in studying late Nineteenth Century technology that patent drawings often represent devices that would not actually work. Until 1880 the US Patent Office required that a working model (no bigger than one cubic foot) be submitted with each patent application. Sadly the Patent Office got rid of its collection of models in 1925.